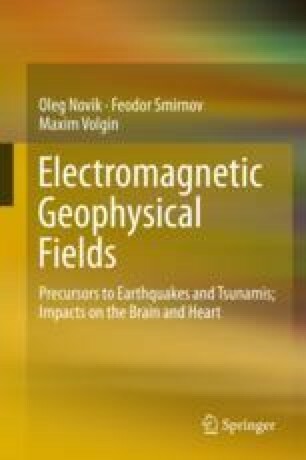 In this chapter we investigate, from the mathematical viewpoint, the problem of vertical hydrodynamic wave fronts (shock waves) arising as a result of nonlinear tsunami process development. As the model PDE (partial differential equation) we apply the Burgers equation of turbulence, modified by us with a term without differentiation. For this equation, we consider the vanishing coefficient of viscosity ε → 0 in the class of self-similar solutions, depending on the linear combination x = y − ct of the spatial (y) and temporal (t) arguments, where c = const is the coefficient; similar solutions are referred to by us as rolling wave solutions (rw-solutions). These solutions are smooth by ε > 0. The shock rw-solutions of the model PDE with ε = 0 are considered in the same class of the self-similar solutions depending on x but with an analog of the hydrodynamic conditions in the breakpoints, i.e., vertical fronts (known as the conditions on a jump). An arbitrary shock rw-solution U0(t, y) is approximated with the smooth rw-solutions Uε(t, y): Uε(t, y) → U0(t, y), ε → 0, according to the rule Ф(Uε(t, y)) = Ф (U0(t, y)), ε > 0, where Ф is the functional determined on Uε(t, y)), ε ≥ 0. It was shown for the modified Burgers equation that the class of functionals allowing for an arbitrary fixed shock rw-solution to construct the approximating sequence of the smooth rw-solutions obeying this rule is not empty; Uε(t, y) is determined uniquely by ε > 0.